When my dad came to Canada from Russia over a quarter century ago he didn’t know about Halloween. Our family legend goes that he was home alone that evening while my stepmom was out. She called him right around the time when little trick-or-treaters were supposed to show up and told him to turn off all the lights and hide in the basement while she rushed home with bags of candy. I am not even sure if the story is true or if I’m making it up, but every year it makes me smile. I came to Canada almost twenty years ago and fell in love with this holiday. I loved coming up with costumes when I was still in school and putting on makeup and decorating our front yard. I went trick-or-treating until I was 19 years old (not even exaggerating here). Once I got older and moved out to live on my own, I started throwing Halloween parties. Those events became quite anticipated by my group of friends. We usually alternate between a regular dress-up Halloween party (you will be turned away at the door without a costume) and a themed party. One year during a Fairy Tale themed party I decided to have a sit down dinner for about 20 people. Everyone was skeptical, but it was such a success that I was asked to do dinner style parties from now on. Last year half of my friends had babies in the fall, so I cancelled Halloween and this year I had to cancel again. This year it was me turning off all the lights in the house and crawling to the nursery to feed my baby and hiding from trick-or-treaters. 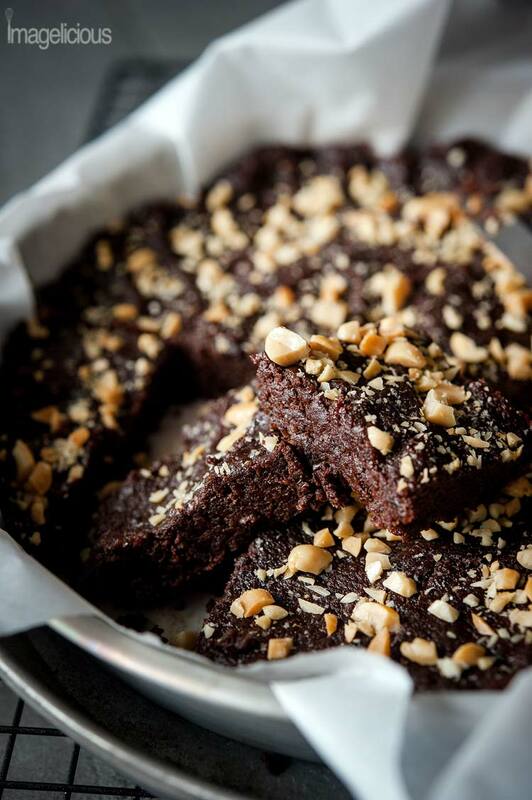 What does this story have to do with these delicious Chocolate Peanut Butter Brownies? Well, I actually bought a big box of candy to give out but since baby didn’t cooperate I had to forgo that activity, which means that I also missed out on Halloween candy. 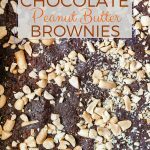 This is when these No Bake Chocolate Peanut Butter Brownies come to the rescue. They are incredibly quick and easy to make. Perfect mom-recipe as not only they require just one food processor and two minutes to measure ingredients, but they could easily be left while making them to tend to a crying baby. They can take five minutes to make or a few hours if you get distracted and that won’t affect anything. 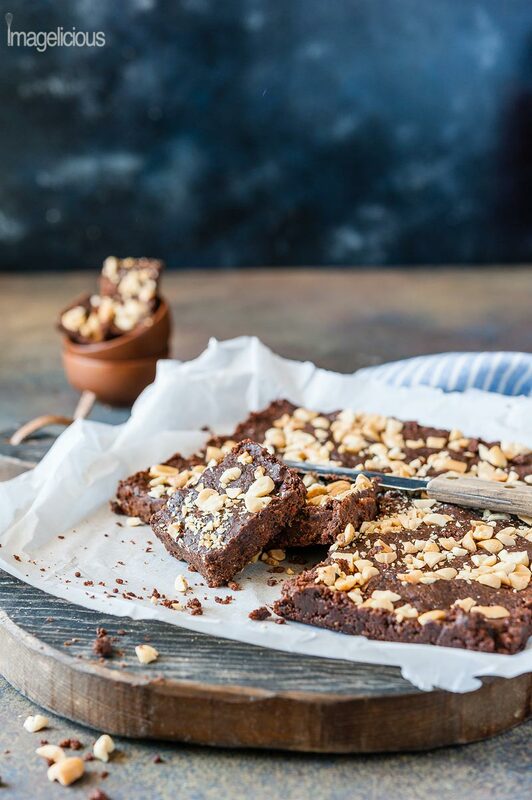 No-one who tried these brownies even knew that they weren’t baked, that they didn’t have any chocolate or butter, that they were actually good for you. 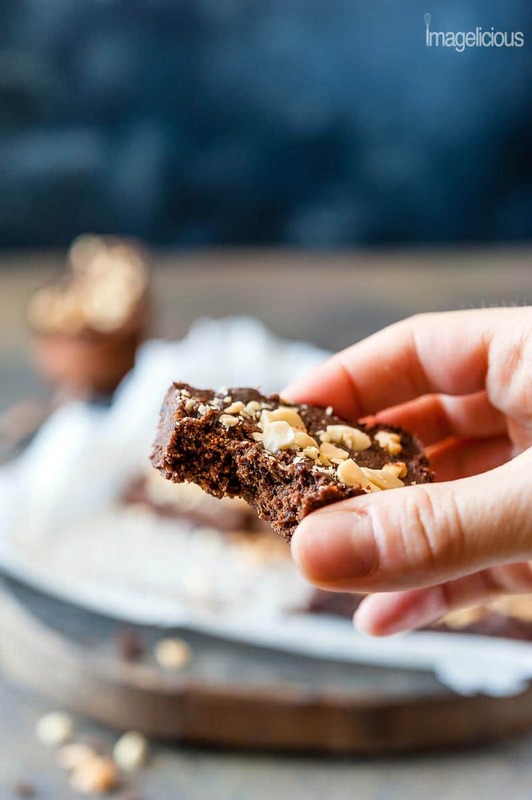 These No Bake Brownies come together super quickly. Just mix all the ingredients in a food processor, if it’s a bit too dry then add a splash of rum, orange juice, or even just water. Spread the mixture into your pan and chill for half an hour or more in the fridge or if you’d like to eat them sooner, then freeze for about 10-15 minutes. Once the mixture is chilled, cut into small squares and enjoy. Super easy and delicious! Don’t forget to watch the video below to see how easy and quick these No Bake Brownies are!!! 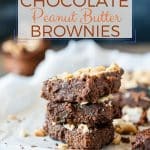 What are the ingredients in these No Bake Brownies? All the ingredients are healthy and delicious and good for you. 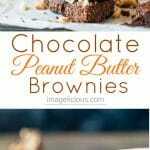 They still contain lots of natural sugar and fats, so even though these delicious Chocolate Peanut Butter Brownies are much healthier than their regular counterpart, they should still be enjoyed in moderation. Orange Oil – do you really need it? I’ve mentioned orange oil at least a dozen times in my recipes. You don’t really need it. But you kinda do!!! It is one of my most used ingredients when I make desserts and it makes EVERY dessert special. About 99% of the time if I use orange oil in something sweet, people ask me what it is. It gives the desserts an extra oomph and just makes them a bit (a lot) extra special. I very strongly urge you to try this Orange Oil. There are two different bottles for the orange oil but they are both the same. I think they changed the label or maybe it’s just different size. I have both. You can use medjool dates as they are crazy popular right now. However, they are quite expensive. Feel free to use honey dates instead. They are cheaper, yet just as delicious. They work perfectly in this recipe as they are also very soft. You can buy honey dates at your local bulk store usually. 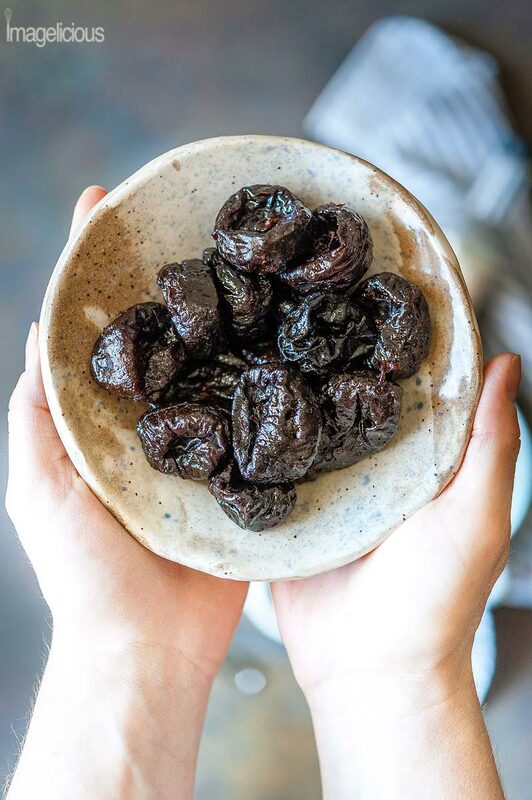 Prunes aren’t well liked in North American cooking for some reason, yet they are utterly delicious. I use prunes in this recipe to break down the sticky sweetness of the dates. 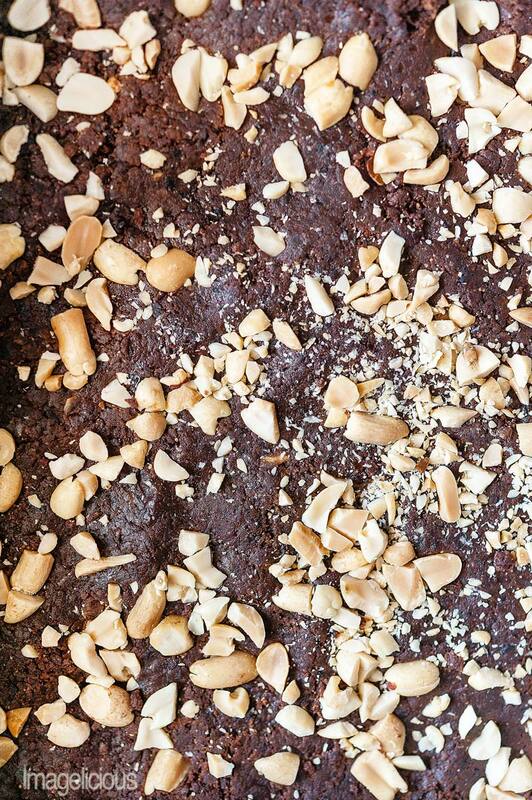 Prunes add a much needed tang to these Chocolate Peanut Butter Brownies. I made this recipe with natural peanut butter and the regular kind. They both work the same. If you use a natural peanut butter you might need to add a bit extra maple syrup since that kind of peanut butter has no sugar although I don’t. 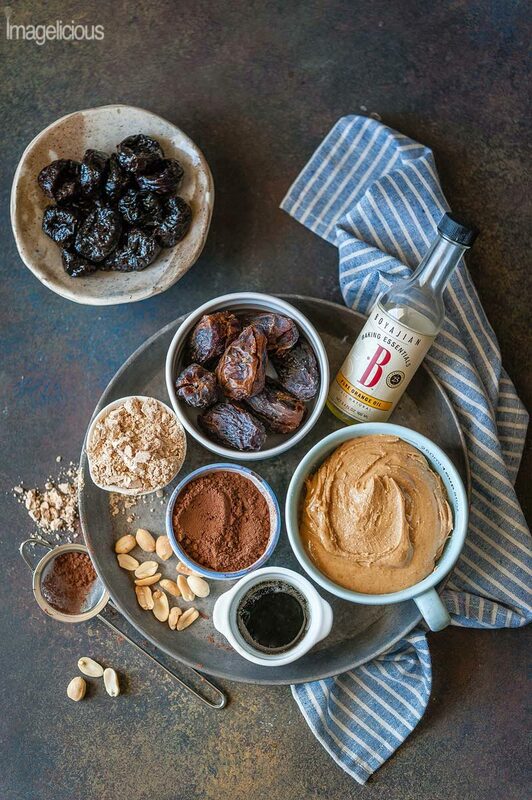 You can also use different kinds of your favourite nut butters. You can use sun butter also. 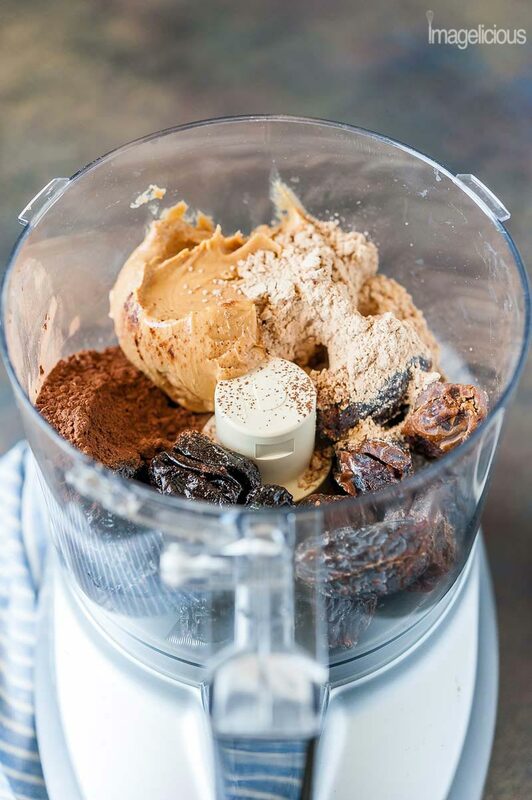 I use Chocolate Peanut Butter Powder to add a bit extra chocolate and peanut butter flavour without the fat. You can use regular Powdered Peanut Butter or you can omit it altogether. You might need to add a couple of extra pinches of cocoa powder if the mixture is too wet. I don’t eat honey, so I always use Maple Syrup if I need to add a liquid sweetener. Feel free to use honey if you’d like. 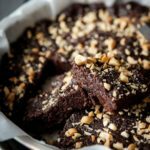 You can also most likely use other liquid syrups such as Golden Syrup or Agave Syrup but I haven’t tried that in these No Bake Brownies. Although, Golden Syrup is totally delicious!! 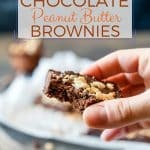 Rum is absolutely totally delicious in these No Bake Chocolate Peanut Butter Brownies. It adds a bit of extra sophistication to the flavour, however it is totally optional. Depending on how fresh the dates are, the mixture might be a bit too dry, if that is the case and you don’t want to add rum, then you can add a splash of orange juice, apple juice, or even just a teaspoon or two of water. 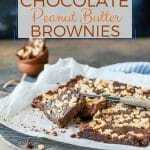 These No Bake Chocolate Peanut Butter Brownies will last for about a week in the fridge, but to be honest they never lasted this long in my household as they go amazingly well with a fresh cup of coffee in the morning. There’s still a lot of sugar in these brownies, but it’s healthy and natural, so I feel really good eating them. 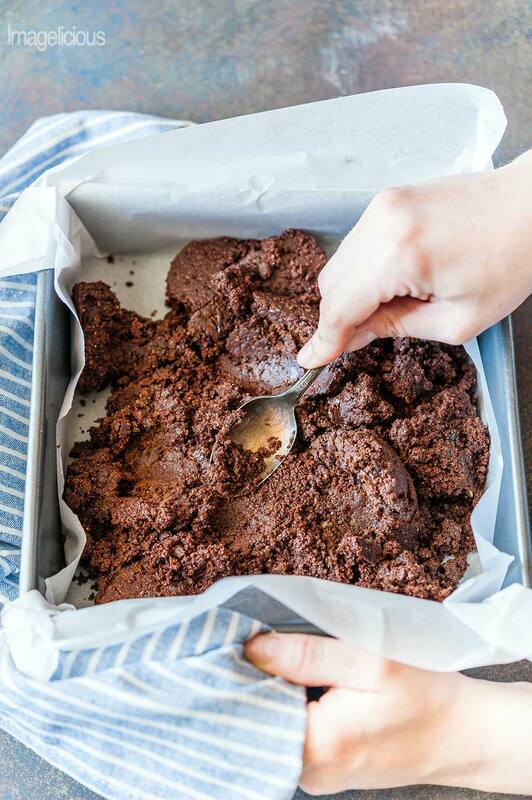 These No Bake Brownies are smooth and fudgy and chocolatey. They have a slight tang from prunes and a hint of orange. Oh, and they will definitely hit the spot if you are missing a certain chocolate and peanut butter Halloween candy! For an even healthier and no less chocolatey treat try my Avocado Banana Chocolate Pudding. It is smooth and velvety and chocolate and sweet! 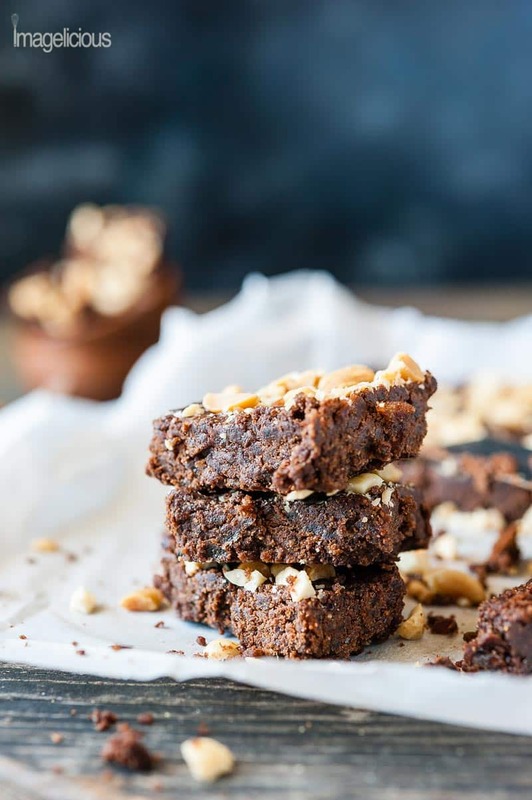 It’s also raw, vegan, gluten-free and oh, so delicious! Another version of dates and prunes chocolate concoction: Gingerbread Truffles. Totally delicious Apple Pie Energy Balls. 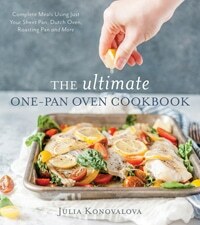 Don’t forget to PRE-ORDER my NEW COOKBOOK, The Ultimate One-Pan Oven Cookbook! It’s coming out on August 28, 2018 and I am super excited! Also, follow me on Instagram where once a week I cook recipes from my cookbook LIVE!! 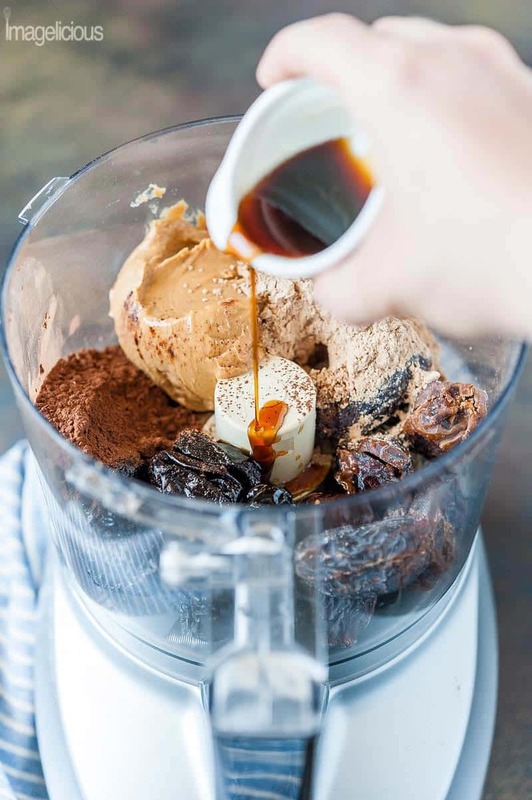 In a food processor, combine all the ingredients and process until very smooth. You may need to stop it a few times and use a spatula to get the mixture off the sides. If the mixture is too dry, add an extra spoon of maple syrup or rum/brandy/orange juice or even a teaspoon of water. Place the mixture into a parchment lined form and spread evenly. Sprinkle with chopped peanuts and press down if using. Refrigerate for at least 30 minutes. Or freeze for 10-15 minutes. * I used both honey dates and medjool dates for this recipe. I love medjool dates, but I find it's a shame using them in these brownies as their beautiful flavour and texture gets hidden. I suggest using honey dates as they are still sweet and soft and a bit cheaper than medjool dates. ** Use either plain regular peanut butter or natural peanut butter. If you are using natural peanut butter which has no extra sugar, you might need to add a bit more maple syrup but I don't. I've tried the recipe with both types of peanut butter. *** Powdered peanut butter adds extra peanut buttery goodness. 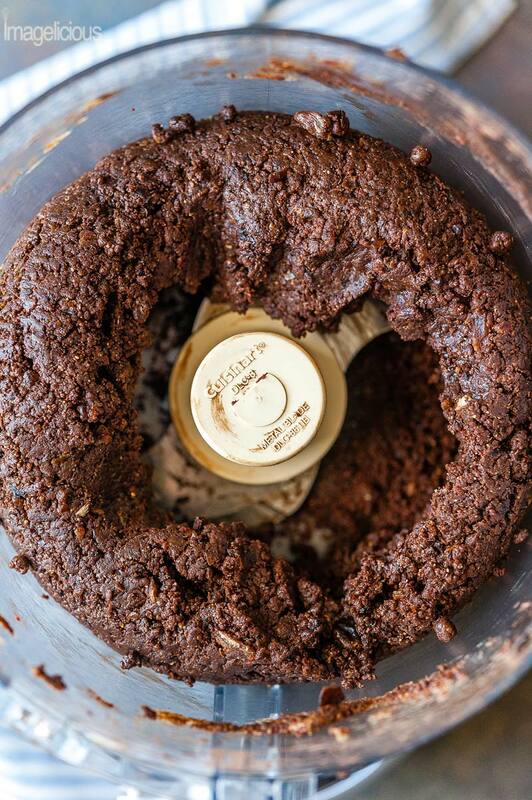 You don't have to use Powdered Chocolate Peanut Butter and you can use regular one. Alternatively, you don't even have to use powdered peanut butter at all. I haven't tried these brownies without it, but I have a feeling that it could be simply omitted or replaced by extra cocoa powder. If you just omit powdered peanut butter you may need to reduce the amount of liquid, i.e. less maple syrup/rum. This is just a guess as I haven't tried those substitutions. **** Orange oil is my absolutely favourite ingredient to use in baking. It's not necessary but I highly recommend investing in a bottle. It'll last or a while. Halloween is one of my favorite holidays too, and we throw a big party every year where EVERYONE has to wear costumes too, so fun! This recipe sounds amazing, and I definitely believe you when you say no one will know it is healthy, the flavors must be so rich. As always your photos are just breathtaking! 19! I love that, so sweet. I think I’m as excited for Halloween as my kids are – such a silly, fun night. And, I love prunes, they are totally underrated and such a good natural source of sweetness. These look perfect for road trips to the cottage and picnics with my kids.